Last weekend we were lucky enough to be visiting our friends in Felixstowe. They live within a short stroll of the beach and on this occasion, the weather was (just about) good enough to have an enjoyable couple of hours sunning ourselves on the beach. 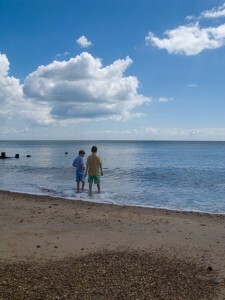 We even braved swimming in the (rather bracing) sea. It got me thinking about the great British summer, which seems to me to be not what it used to be. The last few summers feel like they have been a bit of a disaster. So I decided to compare the weather stats for the last 5 summers (May-Sept), with the ‘good old days’ (from age 8 to 21). A bit of googling and I had the stats and the figures for average rainfall confirmed everything: average rainfall has gone up 9%. Ha! I knew it. But hang on a minute. Look at the stats for average hours of sunshine and you get a different story. Sunshine hours have gone up by 10%! Can it be that the good old days were not so wonderful as we remember them?